Buckle Covers from Childharness.ca. 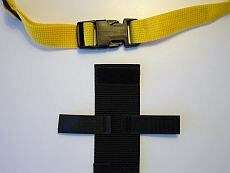 Buckle covers prevent removal of the Child Harness or Special Needs Safety Harness from childharness.ca. 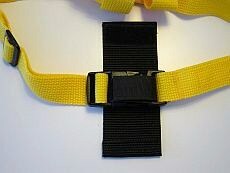 The Baby Harness and the Special Needs Safety Harness buckles at the back. For most children, especially toddlers and younger children, this feature alone is enough to prevent them from removing the harness. 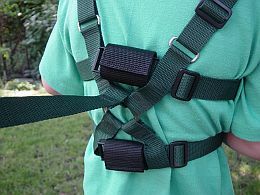 For older children and teens diagnosed with autism or ADHD who are wearing a Special Needs Safety Harness, having the buckles at the back may not be enough to prevent them from attempting to remove their new harness. In these cases, buckle covers may be the answer. They are easy to use and very effective. 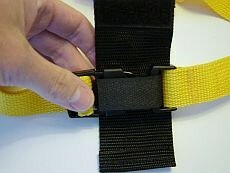 The buckle covers are difficult to remove from the harness because the velcro wrap is very sticky. 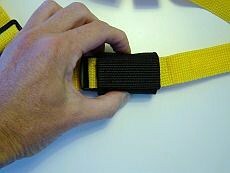 To make the buckle covers even more effective, put them on the buckles "backward" by placing the opening of the wrap against your child's back. When the Special Needs Safety Harness is fitted on them properly (snug but not tight), there is little or no room for determined fingers to manouver the cover open. 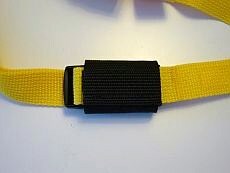 Your Baby Harness or Special Needs Safety Harness will last you for years. Will your child try to reach the buckles now? Will they try in future? 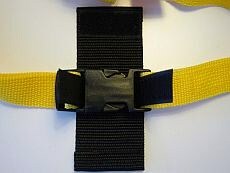 If you know these covers are not sufficient, consider ordering your Special Needs Safety Harness with Locking Buckles instead of our regular buckles.